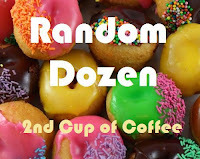 The Daily Swan: Random Dozen! When Stephen (the hubs) reads this, he'll LOL, as will my mother. I would have to say hot dogs. Or maybe eggs and toast. Want me to come over and cook tonight? HA! The bathroom. Good thing since I'm there about half the day. Ok, ok. Probably not what you had in mind, right, Lid? I really like going to the Indy Children's Museum. Always something new to explore. was able to see my feet while standing. Oh. That's a dangerous one. Practical answer? Diapers. Selfish answer? Fresh flowers. that I chew milkshakes. You know, those little tiny ice crystals could form a choking hazard unless properly masticated. our church's praise team practices. We have a great time messing around and occasionally accomplishing something akin to practice. Work on Caleb's baby book. I'd like to have it up to date before the next baby arrives. Don't know. I'll be on the lookout. Today I'm going on a field trip with both kiddos to the local petting zoo. It'll be nice to see them in a school setting. good answers, I agree with you on fresh flowers but wipes or diapers would be great, although now we are using cloth.